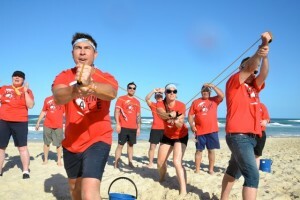 Selecting a professional team building activities or corporate events service for large groups. 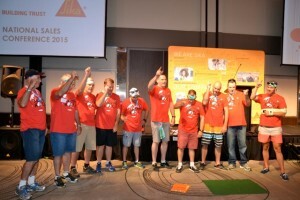 Was the 1st step in SIKA Australia’s team development path. As well as reward their staff. Designed to achieve outcomes such as positive staff interactions. Whilst sharing a series of unique Surfers Paradise, Gold Coast experiences. SIKA Australia is a specialty chemical supplier for the construction and building industry. Simply put “sika provide the adhesion to keep a building industry together”. Key facilitator and host Konrad Lippmann writes this team building case study review. Incorporating Building Trust as the theme of the conference. SIKA is well known for its bonding product range such as SIKA-FLEX. 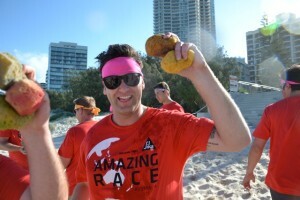 Hence Thrill worked on the concepts of Flexibility and Bonding to develop a very special – custom built Amazing Race around Surfers Paradise on the Gold Coast. Ensuring that 90 delegates staying at the QT are entertained, engaged and participate was the foremost focus for THRILL facilitators. Balancing physicality, intellectual challenges with fun that results in everyone being happy safely was achieved. Through excellent planning and working with local businesses to ensure a seamless delivery that bonded the teams. 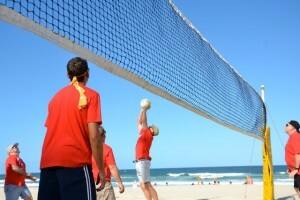 Beach Volleyball for the united Team Activity as a Road Block where all teams challenged their skills. 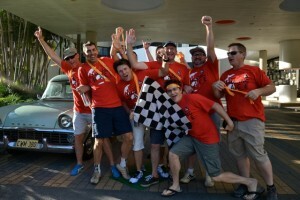 The next checkpoint tested Sling Shot Shooting teamwork skills for getting teams on target! Further activities and corporate challenges included a special Creative at art session. Providing insight, sharing and learning more about colleagues. The SIKA business team was inspired at the creativity exhibited in the Caricatures. 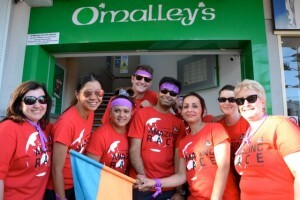 Visiting O’Malleys Bar on The Surfers Paradise Golden Path for a refreshing, rewarding, hydrating drink before deciphering clues to the secret pitstop location. For further details on corporate team development or incentive events and staff rewards. On the Gold Coast and in Surfers Paradise. Please Contact Thrill team events on m: 0459111129. 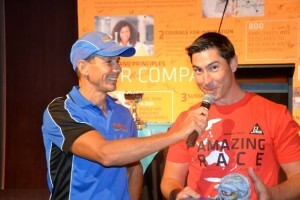 Discuss your next amazing race or conference break activities. Engaging your staff, employees and people with excellent conference package solutions. That can include Gold Coast Theme Parks, Jet Boating, Quad Biking, Segways. Exploring the natural Gold Coast hinterland in ex Army Jeep 4WD’s with search and rescue scenarios. Abseiling waterfalls, experiencing rainforests and getting away from it all on an Bear Grylls style adventure.